I'm being chased. I can't see the enemy, but I can hear it crashing through the streets mere seconds behind me. I vault through a window, then through a burned-out floor to a second story landing. I jump from another window to an adjacent rooftop, careening across the metal and concrete of this industrial landscape. I beam a set of coordinates to Command. "Stand by for Titanfall." A streak of flame erupts across the sky. The entire ground explodes mere feet from where I'm standing. The smoke clears, and there's my Titan--a mass of steel and hydraulics, a giant mech outfitted with a cannon on one arm and a shield on the other, bristling with missile launchers. And just in time. Around the corner lopes the enemy Titan. I could hop in my own Titan and take the enemy one on one. I could--but I won't. Instead I quickly toggle my Titan's AI into Guard mode. My Titan unfolds from its hunched, protected position, bringing guns to bear on the foe. Confronted with something its own size, the enemy Titan forgets about me. Big mistake. I sprint past the enemy, now locked in a duel for the ages. I take special care not to die beneath its enormous feet--a particularly egregious death both in terms of physical pain and embarrassment. Once past, I turn and sprint toward--yes, toward--the enemy Titan, leaping onto its back. I land next to the smoking remains of the enemy, my own Titan now placid in the absence of enemies. I toggle it into Follow mode, and we waltz away from the scene to find more battles. The Titanfall beta, as suspected, will start this Friday, February 14, and runs through February 19. You can sign up for it now, though you'll need an EA Origin account. It's also limited to the PC and Xbox One. All my impressions come from a similar build of the game, which I spent three hours playing last week. It wasn't enough. I need more. The gathering of journalists played three different modes: Attrition, Hard Points, and Last Titan Standing. Attrition tasks you with killing enough enemies to reach a score limit--similar to a Team Deathmatch mode, except that there are fodder AI enemies in the mix. Scoring is tiered based on difficulty. Basic grunts, for instance, are worth a single point, while player-controlled enemies are worth four. Hard Points is similar to Battlefield's Conquest mode, with multiple points to capture and hold, except your team is filling a meter over time instead of decreasing the enemy's ticket count. Last Titan Standing is--as you probably guessed--a duel to the death between two teams of Titans. If your Titan is destroyed, you can eject and still participate in the game on foot, but ultimately whoever pilots the last Titan wins the game for his or her team. You may have heard the dismissive description of Titanfall: "It's just Call of Duty with mechs." On the one hand, it's not a bad description. If you've put a lot of time into the Call of Duty franchise, your fast-paced arcade-shooter skills will come in handy here. The game's not quite as twitchy as Call of Duty, but this is not a bide-your-time game like Arma 3. Sprint into the fray, shoot as many enemies as possible, die, mash the respawn button, get back into the action. It's definitely frenetic. But oh, it's so much more. Titanfall is essentially the point on the map where three very different types of shooters meet: your modern Call of Duty-esque arcade shooter, your fast-paced retro shooter (a la Quake or Tribes), and your semi-tactical shooter (Battlefield). Movement is important in Titanfall. It's one of the first things you notice when you play the game--how easy it is to leap across rooftops, or chain wall-runs together to traverse seemingly inaccessible areas. It's funny that an increased focus on movement feels like such a new thing nowadays, because it's actually a very old and well-tread argument. In older shooters--Quake, Unreal Tournament, Tribes--movement was key: Double jumps, rocket jumps, and skiing were all part of a competent player's arsenal. But over the course of the last decade or so, movement fell out of fashion in favor of an increased focus on realism. 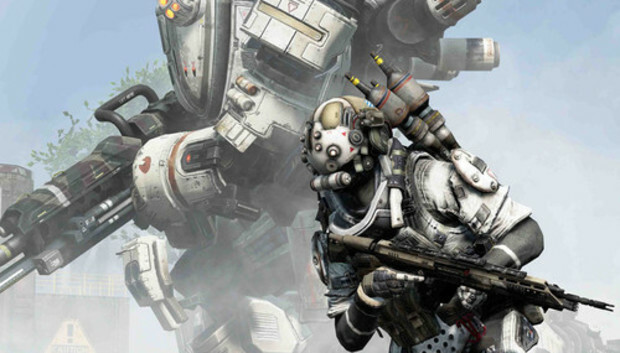 Titanfall's movement feels new, but it's in large part a return to that older philosophy. The game is fast, hectic, and all about verticality. If a sniper is camping out on a nearby rooftop in Call of Duty, for instance, you're going to walk up the lone set of stairs leading to the roof and hope you don't get killed along the way. In Titanfall, you have numerous options: Hop across from an adjacent roof, run up the wall to the roof, eject from your Titan and land on the roof, jump off the back of an enemy Titan and chain that into a wall-run onto the roof, or yes, just walk up the stairs. An experienced player can use movement to great advantage here. ...Which brings me to Titanfall's similarities with semi-tactical shooters like Battlefield. Titanfall , for all its flash and visual pizzazz, is an elaborate, explodey game of chess--a series of checks and balances that imbue this twitch-shooter with a surprising amount of tactical depth. Take the Titan, for example. In any other game, the Titan would be the be-all-end-all weapon--a gigantic robot tasked with destruction. You'd be crazy not to get in the Titan and go all wrecking-ball on the opposing team. But I rarely got into my Titan. I preferred to leave it on autopilot, so it could follow me around and pick fights while I attacked other enemies or captured areas in Hard Points mode. The tradeoff is simple: If you get in the Titan, you have full control of its massive firepower. If you don't get in the Titan it's going to act a little dumber about which targets it picks, but you effectively double your firepower. Also, your Titan will draw most enemy fire away from you because it's seemingly a bigger threat. Or look at Burn Cards. Burn Cards, one-time-use perks that last for a single life, are unlocked after you've leveled a few times. Some are passive abilities, such as one that shoots pulses out into the world and can spot enemies through walls. Others grant you a special weapon, like a sniper rifle that fires exploding rounds. Used appropriately, Burn Cards can alter the tide of an entire game. My favorite check and balance: Your character has a built-in cloak function that's useful for sprinting across open battlefields or lying in wait at a capture point. When I unlocked the sniper rifle, I triggered cloak and hid on a rooftop. Looking through the scope, I was surprised to see the aiming reticule had disappeared--presumably to prevent exactly what I was attempting. Like I said: Titanfall isn't Arma 3. It's still an arcade shooter at heart, and unapologetically so. But I was surprised to find that it has a lot more depth than pre-release footage indicates. As a result, players should find the skill ceiling is a lot higher. As far as progression systems, challenges, meta-systems, and the like--it's all here. You'll spend the first few levels playing as preset classes before earning the right to build a custom class. You'll unlock attachments on a per-weapon basis by completing challenges. You'll make tough calls among a multitude of useful perks. In other words, it's like Call of Duty with mechs. The full game is scheduled to launch in the U.S. on March 11th for Windows and Xbox One, and March 25th for Xbox 360. Our preview time was conducted on an Xbox One. We'll update this article if we find any differences in performance when we test the PC beta this weekend.